It’s getting to be that time of year where I’m baking up a storm. Anyone else loves baking in the fall? One of the easiest things to bake for company coming over is Banana Bread Muffins. The biggest secret I’ve discovered in this easy Banana Bread Muffin recipe is using duck eggs instead of chicken eggs. Oh my goodness! I had heard that people swear by it, but I didn’t realize how wonderful they are to bake with until now. If you can get your hands on duck eggs, they are awesome in baking. You’ll have perfectly fluffy and moist baked goods every time. Begin by preheating the oven to 350°. Fill a large muffin pan with liners. In a mixer, add bananas, sugar, egg, and butter. Mix everything together well until combined. Using a sifter, sift into the mixture the flour, baking soda, baking powder, and salt. Mix until smooth. Evenly add the batter into muffin liners. Bake for 25 minutes, or until golden brown and muffins bounce back when pressed. Let the muffins cool in pan for about 5 minutes. Transfer them to a cooling rack and let them cool to room temperature before serving or storing. Using fresh ingredients creates a healthy banana bread muffin recipe. Trust me, I am all about the boxed goods on busy days but when I can, I like to bake from scratch. These banana bread muffins have a perfect blend of sweet and banana flavoring. Plus, your entire house will smell amazing. Everyone will come running for one. Enjoy this recipe for your next gathering, for school lunches or just because. Baking season is finally here and banana bread muffins make it even better. Enjoy! For more simple recipes, try my No Egg Pumpkin Bread and Birthday Cake Muffins. Simple, easy and fun to make. Add this recipe to your collection by printing our the recipe card below. For a Disney flare, check out my Be Our Guest Inspired Chocolate Cupcakes. Banana Bread Muffins recipe. An easy banana bread muffins recipe that is great for putting on the table for the kids or when company stops by. Preheat oven to 350°. Fill large muffin pan with liners. In a mixer, add bananas, sugar, egg, and butter. Mix until well combined. Sift into mix flour, baking soda, baking powder, and salt. Evenly add batter into muffin liners. Bake for 25 minutes, or until golden brown and muffins bounce back when pressed. Let muffins cool in pan for about 5 minutes. 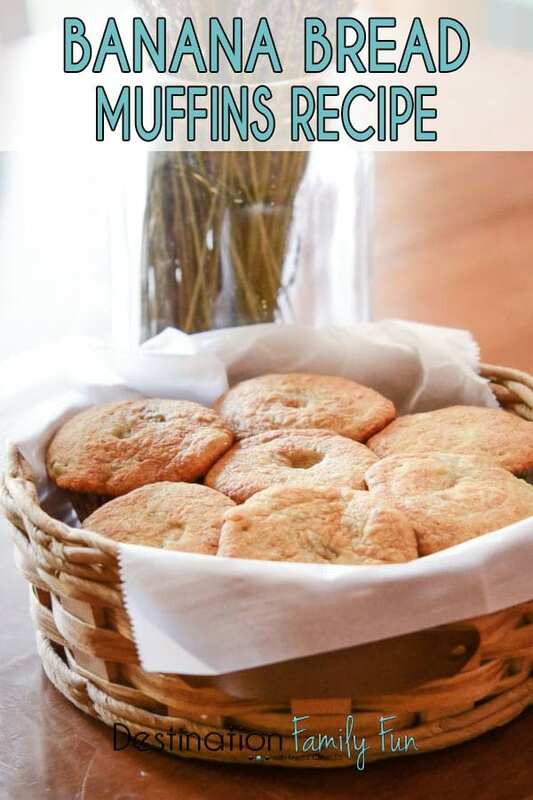 Transfer them to a cooling rack and let cool to room temperature before serving or storing.